With our ability to screen print much larger than most contract screen printers, we offer edge-to-edge custom bandana printing. The standard custom bandana is 22″ x 22″ and screen printing is offered in up to 4 colors either within the boundaries of the square or over the edge. 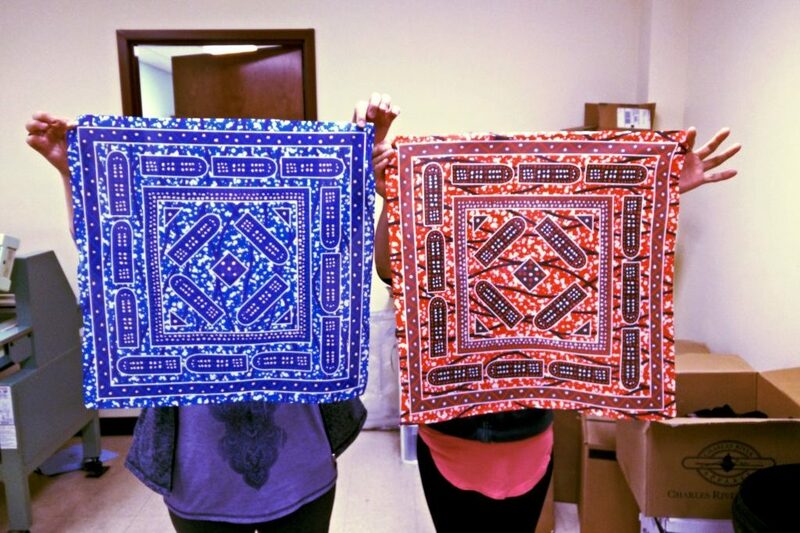 Acrylic based inks offer our clients the ability to have their custom bandanas printed on any fabric content. Cotton Bandanas, Polyester Bandanas and 50/50 Blend Bandanas all print well with acrylic inks. Screen printing bandanas with acrylic inks offers vibrant colors and a low feeling print. Acrylic inks also enable complete edge-to-edge printing for any bandana size. Discharge inks are also a great option for your custom bandanas. Similar to tie dye but much more precise, discharge screen printing allows us to custom dye any design in multiple colors on your bandana. One of the benefits of using discharge inks when producing custom screen printed bandanas is that there is virtually no feel at all to the dyes. Dye Sublimation is a decoration technique that is used to offer photo realistic custom bandana printing. Using digital printing techniques and special inks, we are able to reproduce a high resolution photograph on a polyester bandana. Dye sublimation is available for 22″ and 27″ bandanas. Ordering custom screen printed bandanas couldn’t be easier. Your art area is either 22″ x 22″ for standard bandanas or 27″ x 27″ for jumbo bandanas. For custom screen printing on bandanas you may choose from either acrylic based inks or discharge inks depending on the fabric content of the bandanas that you choose. Dye Sublimated bandanas being as a completely white polyester bandanas and end up with brilliant and full reaching colors. Custom dye sublimated bandanas can reproduce photographs, maps, logos and a wide range of complex and intricate designs. Your color selection is endless for custom dye sublimated bandanas. Still not sure? Order a sample. You can order a sample of a blank bandana to review the quality before placing your order.